Lovely card, love the embossed frame!!! hi sylvie!! 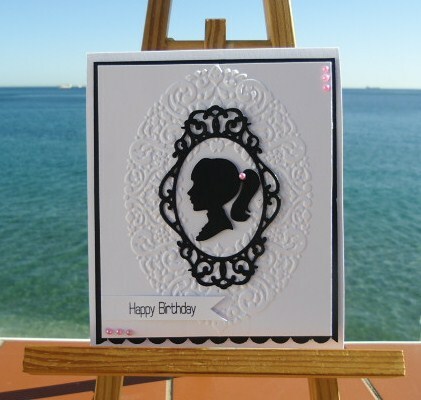 your card is so very elegant... love the silhouette image surrounded by all that beautiful embossing! Your weather sounds perfect Sylvie... not that I'm jealous of course! This is great...there would have been enough of a tad of colour even without the three gems in the corners I reckon... the one on her pony tail alone would have been a very subtle touch! Great cars. love the cameo idea and the tad of colour. Can't beat gems for the touch of colour.